TELL US A RESEARCH QUESTION THAT YOU FIND INTERESTING (basically on anything, except engineering or commercial entrepreneurship). 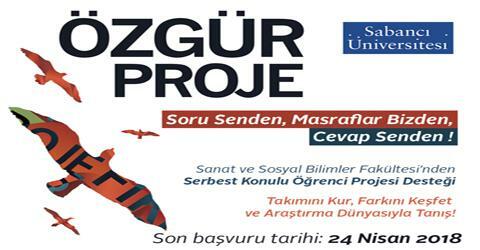 ÖZGÜR PROJE - APPLICATION DEADLINE IS APRIL 24, 2018. Read the files attached. You can apply in Turkish or in English. Please check and like the facebook page https://www.facebook.com/ozgurproje2013 for all the news and projects of the past years. Information and application guidelines are in the attached documents (english and turkish). DON'T UNDERESTIMATE YOURSELF. Very briefly: Your project can be on anything, except engineering or commercial entrepreneurship. It should have some research component so that you learn while you do. We also value social research projects (ranging from economic issues to cultural, political, legal, international, local, or interdisciplinary topics). P.S. : Özgür Proje details in Turkish - English.